There are dentists, and then there are ADC dentists. Providing dentistry both locally and internationally. Dr. Anita Neel is a graduate of the University of Pittsburgh where she earned her BS in chemistry. She then attended the University of Pittsburgh’s School of Dental Medicine and earned her Doctor of Medical Dentistry degree in 2002. Upon graduation, Dr. Neel was commissioned as a Lieutenant in the United States Navy. She graduated from the General Practice Residency Program at the National Naval Medical Center in Bethesda, Maryland. Dr. Neel practiced in Bridgewater, Virginia for two years before joining Aesthetic Dentistry of Charlottesville in 2007 as a partner in the practice. 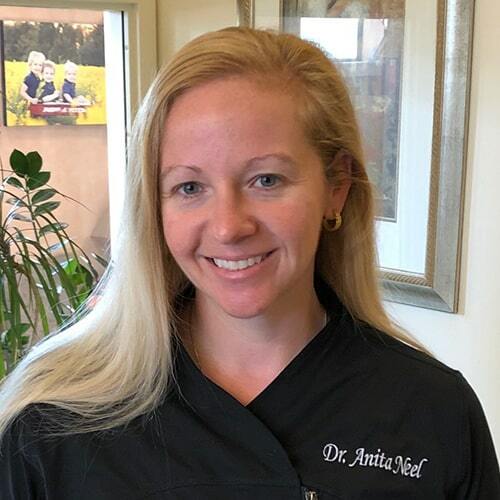 She took over full ownership of Aesthetic Dentistry of Charlottesville in 2015. Dr. Neel has been trained in the most advanced technology utilizing dental lasers, CEREC®, and CAD/CAM technology. She is an Invisalign® Certified Provider. Dr. Neel is a member of the American Dental Association, the Virginia Dental Association, and the Academy of General Dentistry. She is happily married to her husband, Steve, and has three children; Helena, Bobby, and Sammy. As usual, I did not have to wait. I was treated with professionalism and courtesy. Dr. Neel and staff members are always polite. I have recommended Aesthetic Dentistry to several of my friends. Over 35 years practicing in Charlottesville. Dr. Larry Hund is a 1971 graduate of Loyola University School of Dentistry in Chicago, IL and has a Bachelor of Science degree from the University of Iowa. Prior to attending the University of Iowa, he studied Pharmacology at the University of Illinois. Dr. Hund was born and raised in Galesburg, Illinois but chose Charlottesville to begin practicing dentistry. He viewed Charlottesville as the garden spot of the U.S. and felt it was the ideal location to start both a dental practice and a family. Dr. Hund is dedicated to minimizing dental problems at their earliest stages. He takes a comprehensive approach to dentistry, which restores the mouth to its optimal form. Prior to joining Aesthetic Dentistry of Charlottesville in 2006, Dr. Hund had a successful solo practice here in Charlottesville for more than 40 years. He is active in continuing education and is a former president of the Charlottesville Albemarle Dental Society. Dr. Hund is married to his wife, Connie, who also received a BS from the University of Iowa and is a retired dental hygienist. They have three children who graduated from the University of Virginia. Away from the office, Dr. Hund’s interest has been in golf and bridge. He was on his college golf team and considered turning professional but chose to go into dentistry instead. He carried a zero and below handicap and was successful in amateur golf tournaments throughout the East and Mid-West regions. He served on the board of the Virginia State Golf Association. He continues to play recreationally and in recent years has won the Virginia/West Virginia Senior Championship several times. Dr. Hund also played tournament bridge over the years earning master points and even taught bridge through the adult education program while in dental school. Our Charlottesville dentists are excited to welcome you to our office.